The latest large-scale Lara Croft adventure has has a bit of DLC already. But last month’s Endurance Mode add-on didn’t offer up the kind of strong storytelling found in Rise of the Tomb Raider’s main campaign. Baba Yaga: The Temple of the Witch is a new extra chapter that aims to do exactly that. Out today for Xbox platforms, the DLC hitting Rise of the Tomb Raider has Lara hunting down a malevolent witch straight out of old Russian fairytales. Her quest starts when she comes across mercenaries from the sinister Trinity organization hunting down a member of the hidden Remnant community. Once Lara deals with them, their wounded prey—a young woman named Nadia tells her that she was searching for her grandfather, who was on his way to find and kill the sorceress of legend. Lara pledges to help Nadia and soon journeys into a twisted realm that where necromancy is apparently real. Temple of the Witch has some fun offering up a bit of tonal variation and trying to keep players guessing as to whether Baba Yaga actually exists. The sequence above shows Lara being haunted by her own troubled familial legacy and encounter a fantastical threat that’s more imposing than anything she’s fought before. The first chunk of this add-on takes place in pre-existing locales already seen in the main game but climaxes in an all-new environment. Temple of the Witch offers up the same mix of cover-based combat, environment-centric resource gathering and physics-based puzzle-solving. I spent about two hours from start to finish playing Temple of the Witch, getting stuck on a particularly tricky puzzle midway through my session and grinding through a challenging, multi-tiered boss fight at the end. Though the playtime was on the short side, it didn’t feel as anemic as, say, Batman: Arkham Knight’s story-centric DLC. This wasn’t just a bunch of new environments and fight sequences strung together.Temple of the Witch delivered a short story filled with dread, regret and resolution. Yes, you get a new weapon and outfit as rewards for finishing. 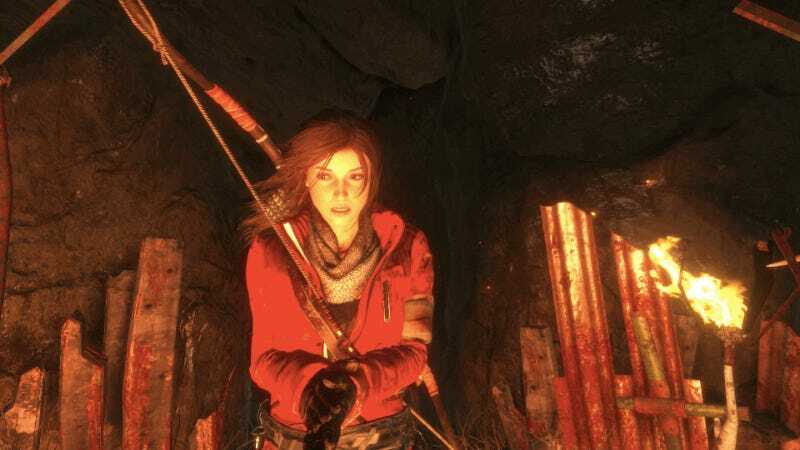 But the better takeaway was feeling like I got to experience Lara’s continuing evolution into someone who braves her own fears to explore the unknown.